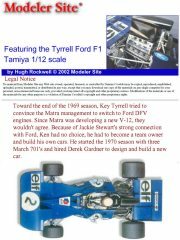 Toward the end of the 1969 season, Key Tyrrell tried to convince the Matra management to switch to Ford DFV engines. 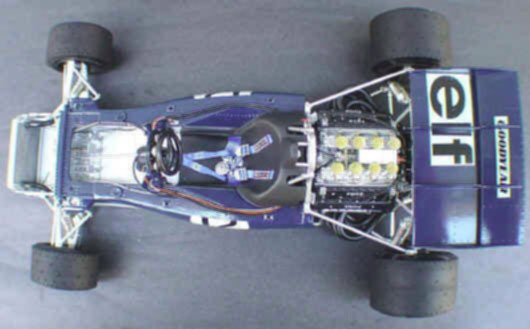 Since Matra was developing a new V-12, they wouldn't agree. 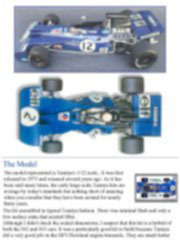 Because of Jackie Stewart's strong connection with Ford, Ken had no choice, he had to become a team owner and build his own cars. 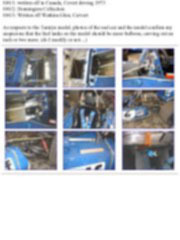 He started the 1970 season with three March 701's and hired Derek Gardner to design and build a new car. 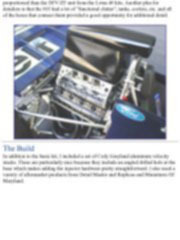 At Ken's request to keep the project a secret, Gardner had to design and build a mock up of the car at his own residence. This prompted some interesting events including Jackie Stewart coming to his house for a seat fitting and a complete Ford DFV/Hewland engine/transaxle being delivered to his front door. Chassis 001 first raced in August of 1970. 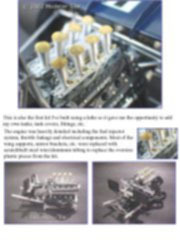 Although Ken desired a straightforward design to ensure dependability, 001 suffered numerous mechanical problems. 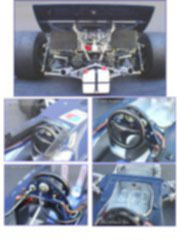 Chassis 002 was completed in time for teammate Cervert to use in the 1971 season. 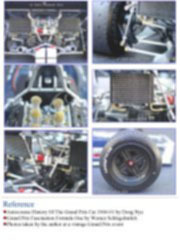 Chassis 003 was first raced in April 1971 giving Stewart both 001 and 003 at his disposal. The dependability issues were solved and Stewart went on to win six races during the 1971 season, which gave him the driver's championship. 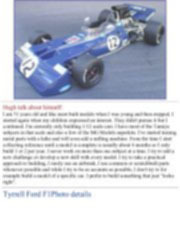 Ken Tyrrell, in the first full year as a car owner garnered the Constructor's Championship. 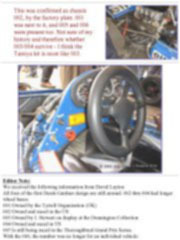 The model represented is Tamiya's 1/12 scale.. It was first released in 1973 and reissued several years ago. As it has been said many times, the early large scale Tamiya kits are average by today's standards but nothing short of amazing when you consider that they have been around for nearly thirty years. 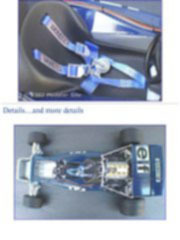 The kit assembled in typical Tamiya fashion. There was minimal flash and only a few surface sinks that needed filler. Although I didn't check the scaled dimensions, I suspect that this kit is a hybrid of both the 002 and 003 cars. 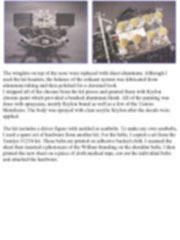 It was a particularly good kit to build because Tamiya did a very good job on the DFV/Hewland engine/transaxle. They are much better proportioned than the DFV/ZF unit from the Lotus 49 kits. Another plus for detailers is that the 003 had a lot of "functional clutter", tanks, coolers, etc. 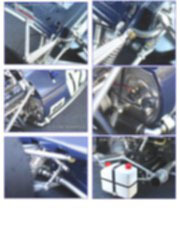 and all of the hoses that connect them provided a good opportunity for additional detail.